For other uses, see Candlemas (disambiguation). Candlemas (also spelled Candlemass), also known as the Feast of the Presentation of Our Lord Jesus and the Feast of the Purification of the Blessed Virgin Mary, is a Christian Holy Day commemorating the presentation of Jesus at the Temple. It is based upon the account of the presentation of Jesus in Luke 2:22–40. In accordance with Leviticus 12: a woman was to be presented for purification by sacrifice 33 days after a boy's circumcision. It falls on February 2, which is traditionally the 40th day of the Christmas–Epiphany season. While it is customary for Christians in some countries to remove their Christmas decorations on Twelfth Night (Epiphany Eve), those in other Christian countries historically remove them on Candlemas. 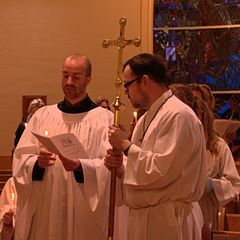 On Candlemas, many Christians (especially Anglicans, Methodists, Lutherans, Orthodox and Roman Catholics) also bring their candles to their local church, where they are blessed and then used for the rest of the year; for Christians, these blessed candles serve as a symbol of Jesus Christ, who referred to himself as the Light of the World. Pope Gelasius I (492–496) contributed to the spread of the celebration, but clearly did not invent it. Moreover, the link made by Caesar Baronius between the presentation of Jesus and Lupercalia is probably inaccurate since Lupercalia was not celebrated in Jerusalem and it was only there that one finds some celebrations of the presentation of Jesus around this date. But it appears that it became important around the time of the Plague of Justinian in 541, before slowly spreading West. The ancient Romans celebrated the Lupercalia in mid-February, in honor of Lupercus, the god of fertility and shepherds. The celebration of Feralia occurred at the same time. The Lupercalia have frequently been linked to the presentation of Jesus at the temple, particularly by Cardinal Caesar Baronius in the 16th century especially because of the theme of purification that the two festivals share. In fact, Pope Gelasius I had much earlier written a letter to a senator Andromachus, who wanted to reestablish the Lupercalia for the purpose of purification; and the so-called Gelasian Sacramentary mentions the celebration of the Presentation of Jesus, lending support to the conclusion that Gelasius substituted a Christian festival for a pagan one. However the Gelasian Sacramentary shows a strong Gallican influence and was actually compiled between AD 628 and AD 731, so it is possible that the addition of the celebration was not due to Pope Gelasius at all. Moreover, when Gelasius addressed Andromachus, he did not try to use his authority, but contented himself to arguing for example that the Lupercalia would no longer have the effect it once had and was incompatible with Christian ideals. This could be interpreted as evidence that he had limited influence on the Roman aristocracy. Centuries later, around the year 1392 or 1400, an image of the Virgin Mary that represented this invocation, was found on the seashore by two Guanche shepherds from the island of Tenerife (Canary Islands). After the appearance of the Virgin and its iconographic identification with this biblical event, the festival began to be celebrated with a Marian character in the year 1497, when the conqueror Alonso Fernández de Lugo celebrated the first Candlemas festival dedicated especially to the Virgin Mary, coinciding with the Feast of Purification on February 2. Before the conquest of Tenerife, the Guanche aborigines celebrated a festivity around the image of the Virgin during the Beñesmen festival in the month of August. This was the harvest party, which marked the beginning of the year. Currently, the feast of the Virgin of Candelaria in the Canary Islands is celebrated in addition to February 2 also on August 15, the day of the Assumption of the Virgin Mary in the Catholic calendar. For some historians, the celebrations celebrated in honor of the Virgin during the month of August are a syncretized reminiscence of the ancient feasts of the Beñesmen. Candlemas feast transfers to February 3 if February 2 is a pre-Lenten Sunday, but the blessing of candles still takes place on February 2. Candlemas never falls in Lent (this also applies to the ordinary-form calendar), because the earliest possible Ash Wednesday is February 4. In Swedish and Finnish Lutheran Churches, Candlemas is (since 1774) always celebrated on a Sunday, at the earliest on 2 February and at the latest on 8 February, except if this Sunday happens to be the last Sunday before Lent, i.e. Shrove Sunday or Quinquagesima (Swedish: Fastlagssöndagen, Finnish: Laskiaissunnuntai), in which case Candlemas is celebrated one week earlier. This festivity officially finalizes the end of Christmas for Christians in Puerto Rico; the festivities include a procession where the statue of the "Virgen de la Candelaria" is carried on the shoulders. Others follow with lit candles until they reach a church where a Mass is celebrated. In the evening the festivities continue with a giant bonfire and singing. Virgin of Candelaria (patron of the Canary Islands). In this Spanish archipelago began the identification of the Candlemas with the Virgin Mary. The Virgin of Candelaria or Our Lady of Candelaria (Spanish: Virgen de Candelaria or Nuestra Señora de la Candelaria), popularly called La Morenita, celebrates the Virgin Mary on the island of Tenerife, one of the Canary Islands (Spain). The center of worship is located in the city of Candelaria in Tenerife. She is depicted as a Black Madonna. The "Royal Basilica Marian Shrine of Our Lady of Candelaria" (Basilica of Candelaria) is considered the main church dedicated to the Virgin Mary in the Canary Islands. Her feast is celebrated on February 2 (Fiesta de la Candelaria) and August 15, the patronal feast of the Canary Islands. In the Philippines, she is also the patroness of Western Visayas region enshrined in Jaro Cathedral or the National Shrine of Our Lady of Candles under the Archdiocese of Jaro (with feast day every 2 February), and Barangay Tatala in Binangonan, Rizal, which celebrates her feast on the First Saturday of February. In Silang, Cavite, her feast is observed locally as a triduum from February 1 to 3, with February 2 kept as the actual feast day. Following this is the family meal. Whoever draws the bean on Epiphany must also prepare tamales, which is believed to echo Mexico's pre-Christian past with its offerings of maize. The whole family is invited to this meal (often the same people as for the Rosca at Epiphany), which gives the festival an aspect of family and sharing. These celebrations take place not only in Mexico but also in Mexican communities around the world, for instance in France. It is for this reason that the Mexican tradition also appears in the Inventaire du patrimoine culturel immatériel en France [fr]. Diablada puneña during the Fiesta de la Candelaria in Peru. ^ Edworthy, Niall (7 October 2008). The Curious World of Christmas. Penguin Group. p. 83. ISBN 9780399534577. The time-honoured epoch for taking down Christmas decorations from Church and house in Candlemas Day, February 2nd. Terribly withered they are by that time. Candlemas in old times represented the end of the Christmas holidays, which, when "fine old leisure" reigned, were far longer than they are now. ^ Roud, Steve (31 January 2008). The English Year. Penguin Books Limited. p. 690. ISBN 9780141919270. As indicated in Herrick's poem, quoted above, in the mid seventeenth century Christmas decorations were expected to stay in place until Candlemas (2 February), and this remained the norm until the nineteenth century. ^ Hothersall, Barbara. "Candlemas – Festival of Light". Fulwood Methodist Church Magazine. Retrieved 27 December 2016. In some countries special candles are brought along to the blessing by the worshippers. These are often very elaborate and are highly treasured. Afterwards they are taken home and kept to be lighted at times of stress – during storms, in sickrooms and at the bedside of the dying. ^ Pappas, Christopher A. (18 January 2012). "Ecumenical Candlemas (Feast of the Presentation)". Holy Trinity Anglican Church. Retrieved 27 December 2016. Please join us for a Choral Evensong for Candlemas with the combined choirs of Holy Trinity Anglican Church and Trinity Lutheran Church, followed by a reception hosted by the two choirs. ... Candlemas has been the traditional time when the candles of the church are blessed for the upcoming year. According to some sources, Christians began Candlemas in Jerusalem as early as the fourth century and the lighting of candles began in the fifth century. ^ Mazar, Peter (6 March 2015). To Crown the Year: Decorating the Church through the Seasons (2 ed.). Liturgy Training Publications. p. 253. ISBN 9781618331328. ^ "The Pilgrimage of S. Silvia of Aquitania to the Holy Places". digital.library.upenn.edu. ^ (la) Barri Ducis, L.Guerin, Annales Ecclesiastici Caesaris Baroni,‎ 186, t.
^ George E. Demacopoulos, The Invention of Peter: Apostolic Discourse and Papal Authority in Late Antiquity, University of Pennsylvania Press,‎ 2013, 74–80 p.
^ "Candelaria, Nuestra Señora". corazones.org. Retrieved 2019-02-19. ^ Tenerife, La Opinión de. "Medio siglo de fervor en Candelaria". www.laopinion.es (in Spanish). Retrieved 2019-02-19. ^ "Turismo Tenerife: Alojamiento, Carnaval, Actividades... | Tenerife". www.webtenerife.com. Retrieved 2019-02-19. ^ Álvarez Delgado, Juan (1949). Sistema de Numeración Norteafricano. A. Numerales Canarios.- B. Sistema Numeral Norteafricano: Caracteres. Estudio de lingüística comparada sobre el sistema de numeración y cómputo de los aborígenes de Canarias. Madrid: Instituto Antonio de Nebrija (CSIC). ^ Oja, Heikki (2007). Aikakirja 2007 (in Finnish). Helsinki: Almanach office of Helsinki University. p. 147. ISBN 952-10-3221-9. ^ a b Bayor, Ronald H. (31 July 2011). "Multicultural America: An Encyclopedia of the Newest Americans". ABC-CLIO – via Google Books. ^ "What Is The True Meaning Of Día De La Candelaria?". latintimes.com. 19 January 2016.